Do you or your sales team run meetings or demos to win new business? If so, are you satisfied with how many result in new customers and revenue? Sales professionals often put a lot of time and effort into running their sales meetings and when it doesn't result in new business closed, it can be a struggle to pinpoint where the meeting went wrong. What if you could give your reps a playbook with a step by step checklist for running more effective sales meetings that close deals? 1 in 5 people accept a sales demo on a daily basis. What would it mean for your revenue if you were closing a deal every day? 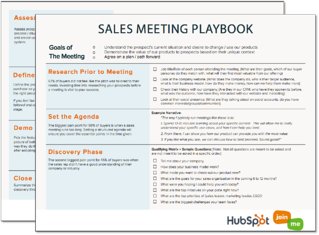 In order to make your sales meetings more effective, HubSpot and join.me have created a simple sales meeting playbook which will help reps research their prospects, ask the right questions, and guide the client towards making a purchase decision. Understand the prospect’s current situation and desire to change / use your products. Grab your copy of this easy-to-follow playbook now, print it out and pin it up so you can start improving your sales meetings and close more deals today.